Chicken noodle soup is easy to make and the perfect solution when you need simple and flavorful comfort food. Chicken noodle soup is one of my absolute favorites. In fact my husband claimed it was the best chicken noodle soup I’ve ever made. Whoop, whoop! That means a lot coming from a dude who’s just not that into soup. Hah! Toss in some of our homemade egg noodles, and serve it with this homemade cracker recipe or our easy french bread recipe! This was originally a sponsored conversation written by Mama Loves Food on behalf of College Inn®. The opinions and text are all mine. 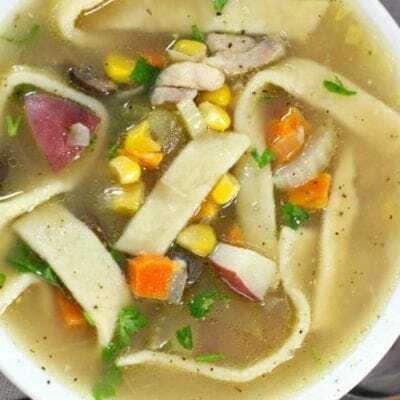 Chicken – we like to use chicken thighs in our chicken noodle soup as they are more flavorful and don’t get dry when cooked. If you’re looking for a lower calorie version, go ahead and sub chicken breast. Onion – I’m partial to the sweet yellow onion for it’s mild flavor. Garlic – if you have fresh garlic available, use that as it adds a lot to the robustness of the broth. Seasoned salt – we really like Lawry’s seasoned salt. It has a great well rounded flavor profile, but if you have a different one you love then go for it! Flour – just a little bit to thicken up the base of the soup. If you’re making a gluten free version, go ahead and skip this ingredient. Oil – I love the flavor that a good olive oil adds. Celery – it just wouldn’t be chicken noodle soup without celery. Chicken stock or broth – chicken stock is pretty simple to make, but if you don’t have the time or just don’t want to, the stuff from the store will work fine. Potatoes – I like to add red potatoes as they give some bulk to the soup and the starch helps thicken the broth. Also, they taste good! Carrots – much like celery, it’s just not chicken noodle soup without carrots! Mushrooms – I know mushrooms in chicken noodle soup are a little bit controversial, but I just love the earthiness they lend to the soup. So good! Corn – corn kernels add a beautiful bright note to the soup. Noodles – Chicken noodle soup is traditionally served with egg noodles. You can get them at the market, but making homemade egg noodles is also really simple (and fun!). 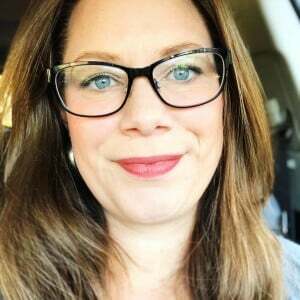 Is chicken noodle soup healthy? 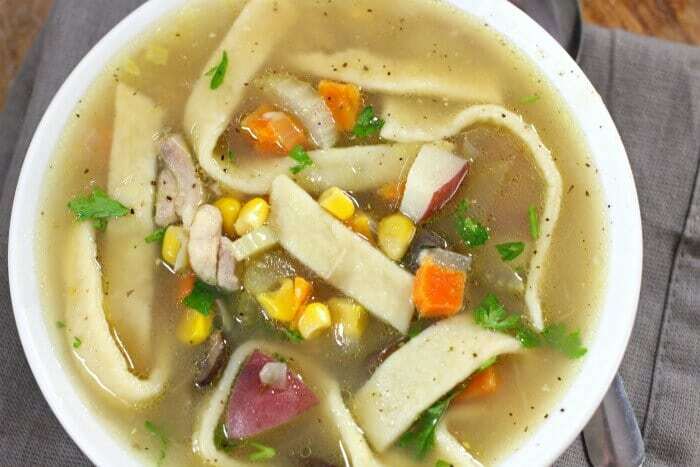 Our chicken noodle soup is chock full of chicken, potatoes, mushrooms, carrots, corn, onions, and garlic. We finished it off with a healthy portion of egg noodles. You can purchase pre-made egg noodles at the grocery store, but for this recipe, I prefer to make my own homemade egg noodles. It’s so easy and adds a wonderful heartiness to the stew. But don’t worry, it’s still delicious even if you don’t make your own. Is chicken noodle soup really good for you? Chicken noodle soup is really good for you, especially when you’re not feeling well. It’s hydrating, full of healthy starches as well as vitamins and minerals from the vegetables. 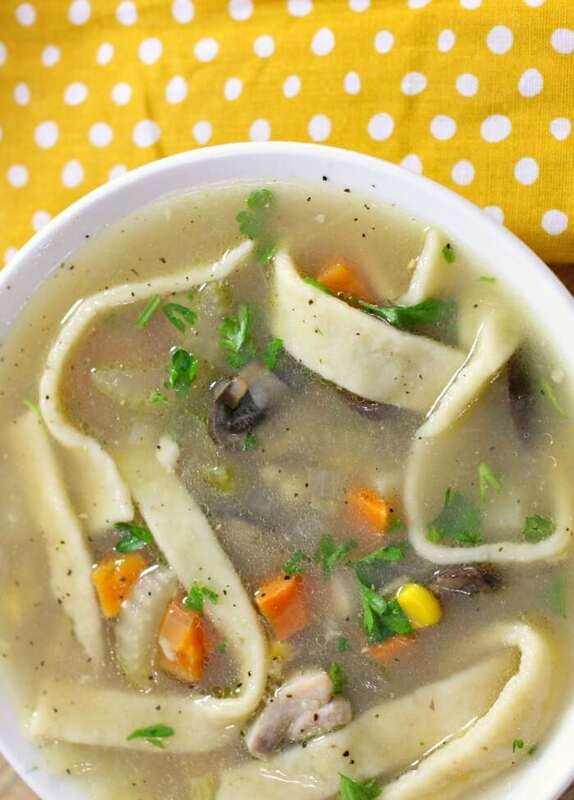 If you make your chicken noodle soup with homemade stock, it’s rich in minerals that support the immune system and contains healing compounds like collagen, glutamine, glycine and proline. Warm chicken noodle soup can also be soothing to a sore throat and comforting if you have chills. I like to serve chicken noodle soup as well as our home remedy for cough and roasted bone marrow when we’re under the weather. What are the best herbs to use in chicken noodle soup? I like to finish off our chicken noodle soup with a handful of fresh parsley, salt, and cracked black pepper. If you don’t have fresh parsley available, dried parsley will do fine. Fresh chives are also delicious in chicken noodle soup, and if you like the flavor of bay leaves, you could toss one in the broth as it simmers. Just remember to remove it before serving. Remove some of the soup with the vegetables and blend it, then reincorporate the blended soup into the main pot. Continue simmering until the stew has cooked down further and thickened naturally. Add two tablespoons of flour or corn starch to a 1/4 cup of water. Mix together to create a slurry, then pour the slurry into the soup and continue cooking for an additional 10 -15 minutes. Toss in a few tablespoons of plain powdered potatoes (like from the mashed potato box), the starch will help thicken the soup. 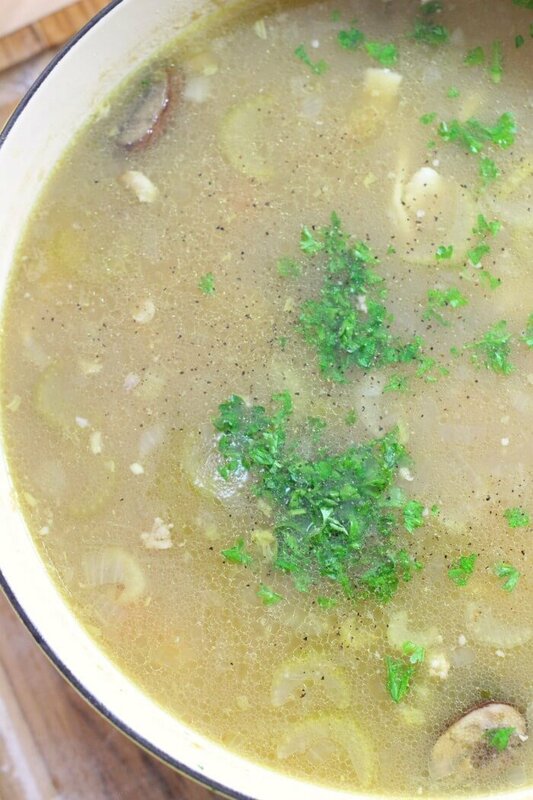 If you’re gluten free, or just not into pasta, you can skip the egg noodles altogether and serve the chicken soup over rice or cauliflower rice! Alternatively, double the amount of potatoes called for in the recipe and mash some of them before serving. Mmmmmm, so good! We also have an amazing chicken zoodle soup recipe if you like zucchini noodles! 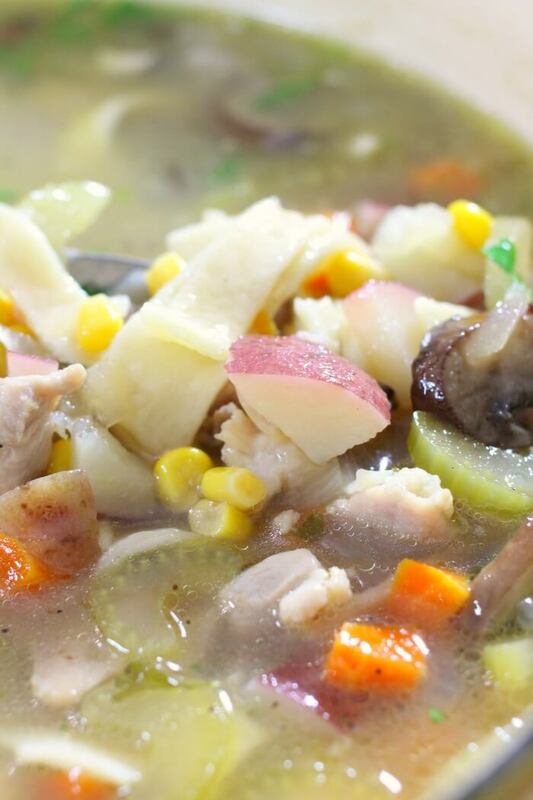 For this recipe we poured the love into our stew by using College Inn® Chicken Broth! 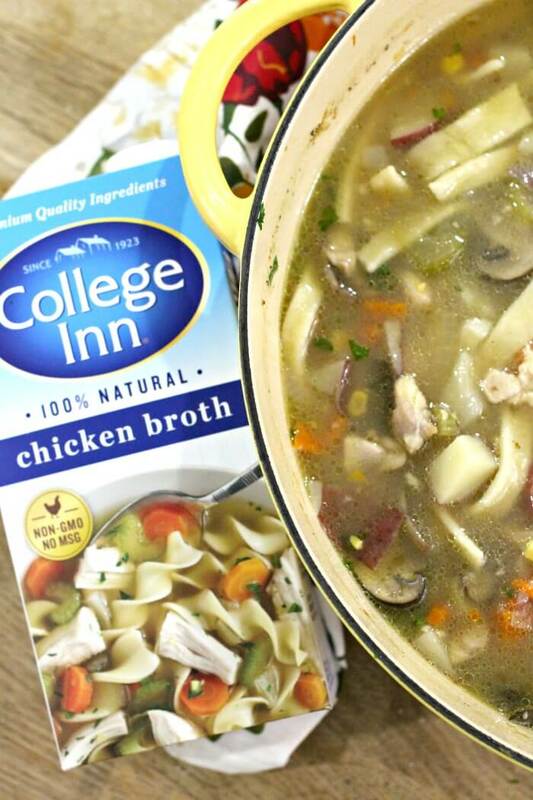 College Inn® crafts a deeper, richer broth; because every detail matters. They carefully select the finest, all-natural chicken and farm-grown vegetables. College Inn purposely blends the most flavorful herbs and spices and then finishes with a long, slow simmer. The savory taste is the detail that helps you make any dish and every meal delicious. With College Inn®, delicious is in the details! Garlic press – Need fresh minced or sliced garlic, but don’t want to peel or chop your garlic? This garlic press is the bessssssst. We’ve had ours for as long as I can remember (maybe a wedding present? ), and I use it several times a week! 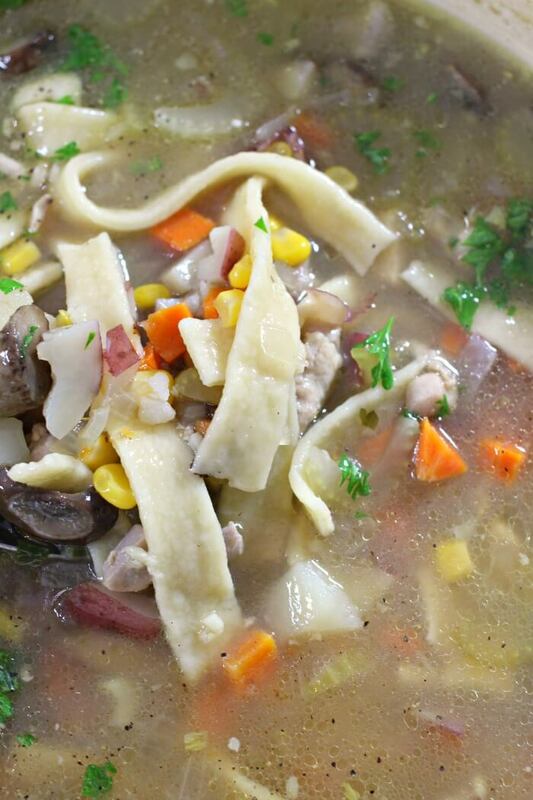 You can watch us make this chicken noodle soup on YouTube (along with our homemade egg noodles!). egg noodles we like to make our own, see how here! In a heavy bottomed stock pan, brown chicken thigh pieces in a small amount of olive or vegetable oil. Remove chicken and reserve. Add onion, garlic, and seasoned salt. Saute until fragrant and translucent. Add flour, and oil. Saute 3 - 5 minutes until flour loses its rawness. Pour in 8 cups chicken broth, and bring to a light simmer. Add potatoes, carrots, mushrooms, and sweet corn. Simmer uncovered until potatoes and carrots are fork tender. Add additional broth if necessary. Return chicken to pot, and drop in egg noodles. Cook to al dente. Finish with salt, pepper, and fresh parsley. Calories are calculated without noodles, calories will vary based on size of chicken thighs and size of potatoes. Here is our homemade egg noodles recipe. « Dinner Rolls – in 30 minutes! 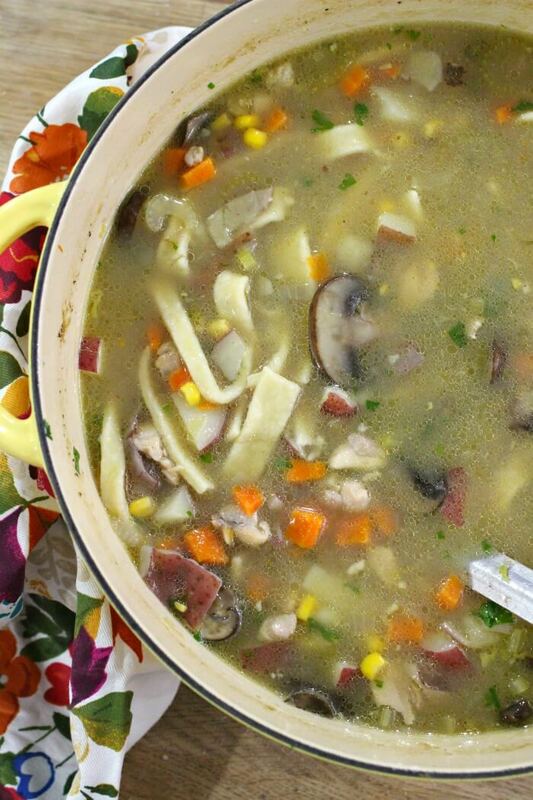 Love all the veggies in this comforting chicken noodle stew recipe! Delicious! This recipe is such a keeper! 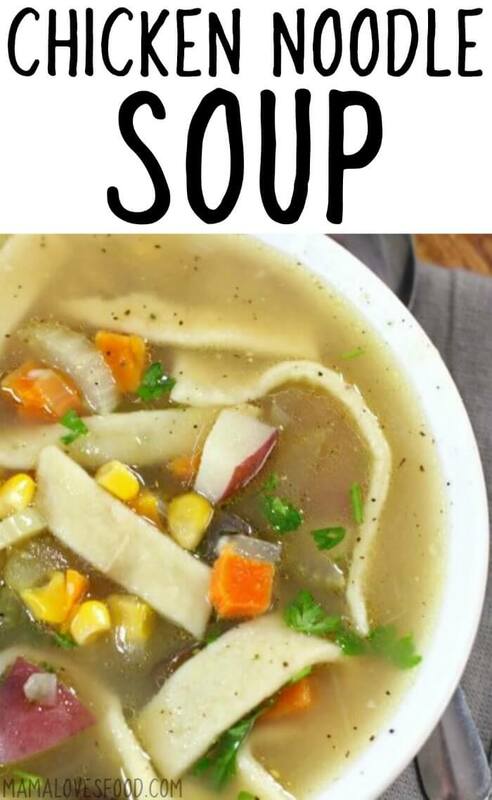 I adore a cup of soup at lunch and this one is so filling. Thanks for the recipe! When do you add the chicken back in the soup? With the potatoes? I’m making this for sure! oops! with the egg noodles! just fixed, sorry about that!